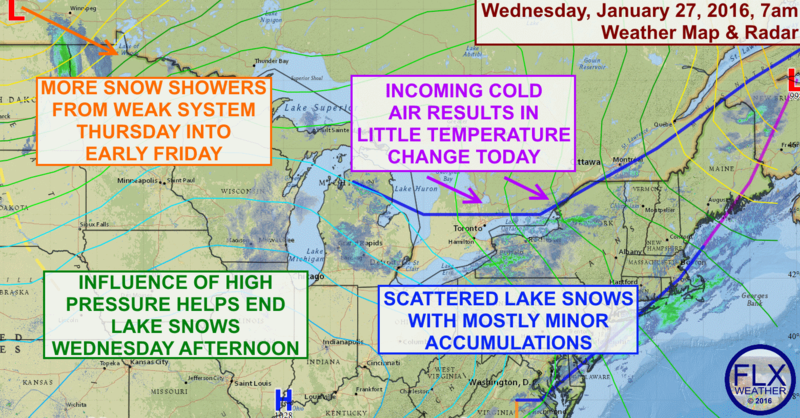 The Finger Lakes will have some chances for minor snow accumulations over the next few days. The Great Lakes are producing a spray of lake effect snow this morning as a series of cold fronts move through. While the heaviest snows this morning are due east of the lakes, winds will turn a bit more northern as the morning goes on, shifting the lake effect to the south. By late this afternoon, high pressure will spread its influence into the region, helping to end the lake effect for most areas. Also, winds will turn more southerly out ahead of an approaching storm system diving across the Great Lakes. This system will spread some snow of its own into the region on Thursday and Thursday night. Most of the snow will be scattered with light accumulations. Snow showers will linger into Friday as some minor lake effect develops behind the storm. Yet another system will approach the area on Saturday. Precipitation out ahead of this system will start as some snow, but could eventually change to some rain before ending. Sunday currently looks dry. Temperatures on Wednesday will change little during the day as incoming cold air counteracts the normal daytime heating. Temperatures will be stuck in the low 30s as a result, with overnight lows mostly in the 20s and a few teens. Thursday’s temperatures will reach the mid 30s before slightly cooler temperatures on Friday. Warmer air moves in by later Saturday afternoon, with 40s possible Sunday and Monday next week.